We’ve worked with our friends at Logitech to make it even easier for Harmony Hub users to get more out of their home. Now that Yonomi and Logitech work together, you can effortlessly integrate all of your Harmony Hub’s smart home systems into your Yonomi Routines. We’re making customizing and controlling your home environment easier than ever. Take a gander at what a day in the life of a Yonomi User with a Logitech Harmony Hub could look like. Your effortless morning routine just got better. It’s time to leave and the days of scrambling around to shut everything off and double check this or that are now behind you. One button takes care of ALL your connected devices. It’s Saturday morning and sometimes you’d rather just stay in bed. Have your Smarthome help you stay on track with this Yonomi Routine. Those Look Awesome, How Do I Get Started? 1. Launch the Yonomi app and sign in. 2. Tap the icon in the upper left-hand corner and select Accounts & Hubs. 3. Tap + in the upper right-hand corner and select Logitech Account. 4. Sign into your Harmony account and press Connect. 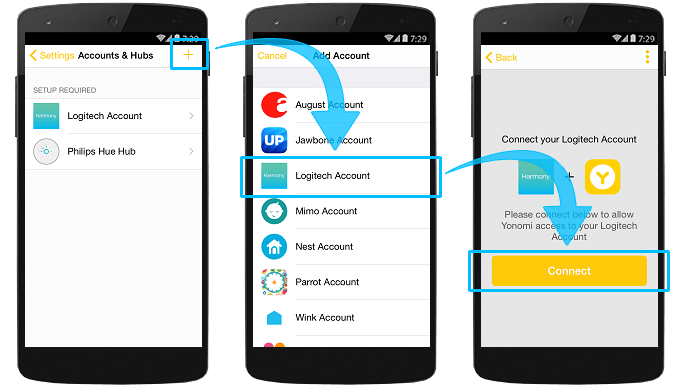 From here you can now go into your existing Yonomi Routines and add in the Logitech piece or create brand new ones like those we suggested above. To check out more of how Yonomi and Harmony Hub can work together to make your daily life easier, visit the Harmony and Yonomi Support page. Along with the Harmony Hub, Yonomi plays well with over 60 of the most popular devices. They no longer have to run independently in multiple apps. An action taken with one device, can trigger a sequence of actions of your other devices, making your connected home simpler and more comfortable.